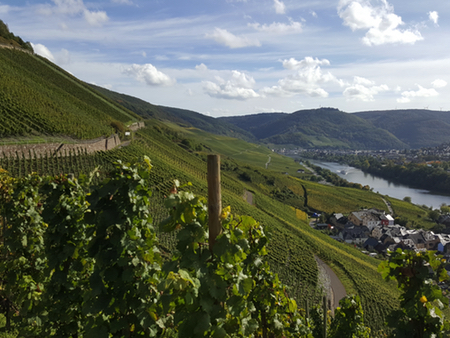 Editor’s note: Andrea Schaefer of Weingut Willi Schaefer, a top 4.2-ha estate in Graach/Mosel, wrote this 2017 vintage report. Last week, I was invited to taste the wines and I will report on these in a separate piece for subscribers. Small but fine—this is how you could describe the 2017 vintage in a nutshell. We are very happy about the “fine.” The distinctive Kabinett and Spätlese wines let us almost forget the anxiety of the 2017 growing season. In the cellar, we have polished, fruity Rieslings with a refreshing acidity. They delight us with their brilliance and clarity. We were unable to produce village-level Rieslings and dessert wines this vintage. How did that happen? An unusually warm, dry March and early April spawned a very early budbreak—almost four weeks earlier than the long-term average. Because of this head start, the damage of the frost on the night of April 18 to 19 was significant. The first loss of yields was therefore predictable. The hot and humid August weather accelerated the development of the grapes and led to an extremely early harvest on September 25, 2017. Fortunately, during the three-week harvest, the weather stayed cool and dry. Also, the typical “Mosel-fog”—a classic concomitant of autumn in our region—had to wait until the end of the harvest. This year, due to the adverse conditions, it was a stroke of luck for us. During a very long and time-consuming hand harvest, we were able to pick out the healthy little Riesling bunches, often only individual berries, from those affected by the freak weather. It was demanding and tiresome. We are very grateful to the many helping hands. The result is a quantity of a “half autumn.” But the bright young wines are proof that we made the right decisions. We are happy about the new vintage! Photograph courtesy of Andrea Schaefer.